I don’t write often about South African government and politics. Politics here are complicated and contentious — even more so than other countries I think, due to South Africa’s incredibly tumultuous history over the last half-century. As a foreigner who only moved here a year ago, I generally don’t presume to understand South Africa’s history and current affairs well enough to provide my own commentary. 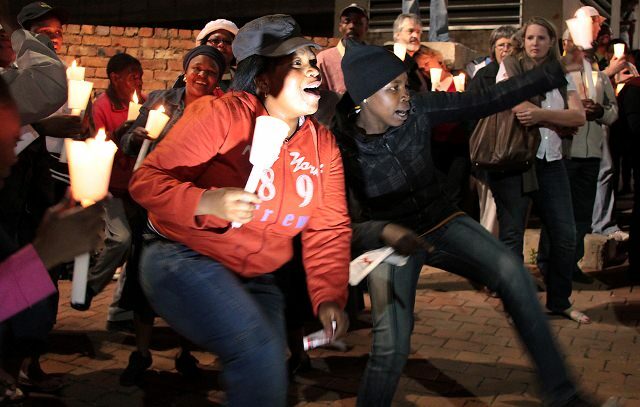 But last night I attended a political event that I’d like to comment on: a candlelight vigil protesting the South African Parliament’s proposed Protection of State Information Bill, also called the Secrecy Bill. 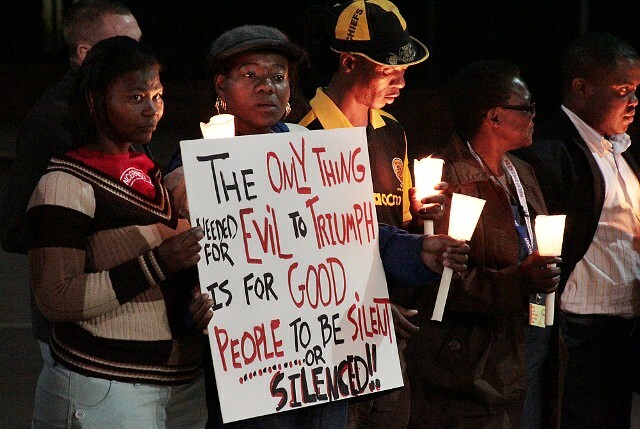 Protesters show their opposition to the Secrecy Bill at last night’s candlelight vigil, which was held on Constitution Hill in Joburg. Similar events were also held in Durban and Cape Town. The Secrecy Bill was scheduled to be tabled before Parliament today, which essentially means it would have been rubber-stamped and promptly passed into law by President Zuma. However, yesterday afternoon the bill was withdrawn indefinitely for further consideration, which is great news for now but not the end of the story. For more details, check out the Mail & Guardian. This proposed bill is really complex and I don’t understand all the nuances. But here’s the gist: The Secrecy Bill would criminalize possession of information that the State deems to be ‘secret’ or ‘classified’. Journalists, whistle-blowers, activists, or anyone else accused of leaking state secrets could be jailed, regardless of whether the information leaked is in the public’s interest. It would be up to South Africa’s Minister of Intelligence to determine what defines ‘secret’ or ‘classified’ information. This legislation is especially troubling in South Africa, a country where people fought so hard, for so long, to overcome the authoritarian apartheid regime in which 90% of the population had no voice. The fact that the Secrecy Bill was drafted by the ruling ANC party, many of whose leaders were jailed for speaking out against apartheid in the late 20th century, just doesn’t make sense to me. 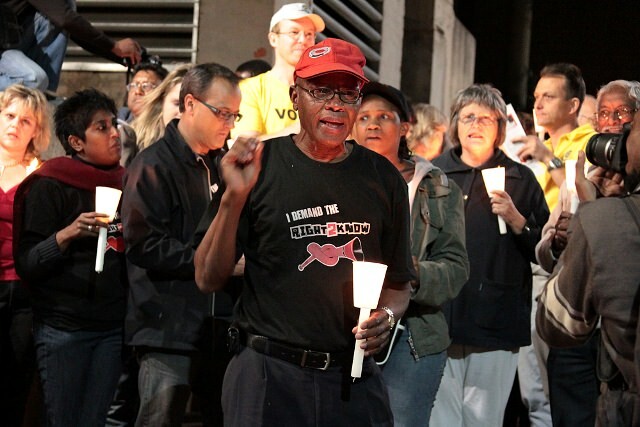 A member of Right2Know, the advocacy group that organized last night’s vigil. The logo on his T-shirt shows a vuvuzela that has been ‘silenced’ after being tied in a knot. Most opponents of the Secrecy Bill believe the bill is designed to cover up corruption and incompetence in the South African government. And let’s be honest — there’s A LOT of corruption and incompetence going on around here. By all accounts, the Secrecy Bill will have far-reaching effects and will most certainly impinge upon freedom of speech in South Africa. Joe was covering the vigil and I initially tagged along as a spectator. But I was quickly drawn into the spirit of the evening. Anyone who wanted to speak was invited to come forward. People spoke about how this protest reminded them of the anti-apartheid protests they’d attended 20 or 30 years ago, or about their fears of how this legislation could affect their daily lives and signify a return to the past. It wasn’t a large crowd — maybe 100 or 150 people — but it was passionate and diverse. There were people of all ages, all races, of every class, and of multiple professions and political persuasions. A South African recently told me, “We sing and dance when we’re happy, and we sing and dance when we’re angry.” Last night was a perfect illustration of that. 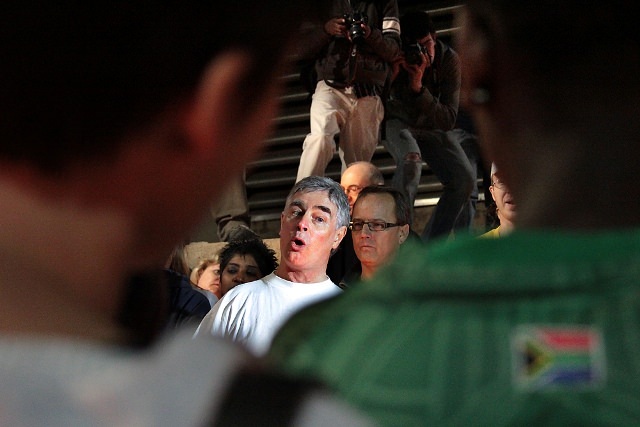 After everyone who wanted to speak had spoken, the crowd burst into song and dance, singing ‘struggle songs’, the very same songs that were sung during the anti-apartheid era, and ‘toyi-toying’, a kind of protest dance that involves foot-stomping and twirling around. These women really know how to toyi-toyi. My mo-ther was a kitch-en girl. My fa-ther was a gar-den boy. That’s why I’m a Social-ist, I’m a Social-ist, I’m a Social-ist! I was electrified by the singing and toyi-toying. Obviously I wasn’t in South Africa during the anti-apartheid struggles of the 1970s and 80s. The vigil gave me a tiny taste of what it might have felt like. I hope this doesn’t sound idealistic or overly dramatic. But last night reminded me that the world is a scary place. Repressive governments around the world are cracking down on their people. Those repressive governments are sparking mass resistance, leading to bloodshed and death. South Africa, although it’s considered one of the most stable (and certainly the wealthiest) countries in Africa, is not immune from that kind of instability. 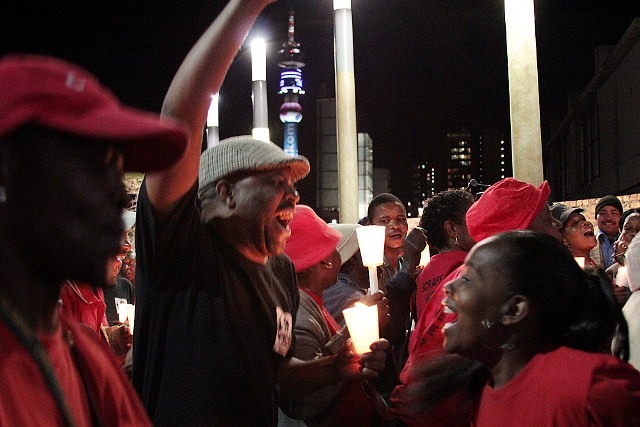 Dancing and singing with Joburg’s Telkom Tower in the background. I hope South Africa’s government leaders, and the South African people whose job it is to hold the government accountable, remember their history. And I hope the Secrecy Bill doesn’t pass. Thank you for a look into something I’ve only had a peripheral view of all my life (mostly via TV and newspapers here in the US.) Stay safe. Excellent post Heather. I agree that it is a scary time for South Africa. I remember when I was there and it was before Zuma’s election. interesting times. I hope they make the right decision. I’m with you on not normally wanting to comment on South African Politics…although I’ve been here nearly 15 years, I still don’t consider myself qualified to do so. That being said – I hope that the govt shows a modicum of sense and does not pass this bill, but rather take the opportunity to really do something about the corruption they seem more intent to hide rather than get rid of. And if you know why it is that the ANCYL gets to call so many shots (literally, the tail wags the dog) and enter into such tittle-tattle playground politics with the ruling party – then please do let me know! I just don’t get it! I am also confused by this ANCYL phenomenon. I don’t understand how it works at all. Need to investigate the history or it, I guess. Totally perplexing. ANCYL seem to have a similar relationship with the ANC as British unions do with the Labour Party. The unions helped found the LP, largely finance it, and act as a feeder. Yes, I actually just went and read up on the history of the ANCYL. It was founded in 1944 and Nelson Mandela, Oliver Tambo, and Walter Sisulu were among the founders. Interesting. I LOVE this post. This is a topic very dear to my heart (maybe to all writers) and like you I simply cannot understand how the ANC can even contemplate writing such a law, let alone passing it. Have they no memory? Just goes to show how people who are in power do the very same things they decried when they were out of it… And yes, the Youth League was what propelled Nelson Mandela into his activism and ultimately changed everything in South Africa, so there is a lot of history you can’t simply gloss over. Certainly the life of Julius Malema today is hardly comparable to Nelson Mandela’s back then. But their history is protest, and so now they still protest, even though it is a very different environment today and it’s not so much protest that’s needed, but cooperation.